Gracie has been with us since January 2017. She was rescued from a hoarding situation and no one knew how old she was. She was small (under 6 pounds) but she was pregnant when surrendered. Based on her teeth, my vet thought 2 to 4 years old. The rescue thought 1 to 2 years old. Based on her activity level I thought around a year. We have a feather on a stick. It’s one of the few “bought” toys the cats will play with. It’s gone through Hazel and Morgan. It wasn’t Mollie’s favorite. Many of the feathers are long gone with a small chewed stump remaining. Every cat went insane for months to years before moving on. In recent weeks Gracie is moving on. Gracie is bunny kicking her toy but the feather is waiting for her. Whenever I sat down to eat (no matter which meal) she brought the feather for me to play. She was loudly insistent if I didn’t. I had more than one meal disrupted with a howling cat or my feeble attempts to wiggle the feather while managing a fork. Over the past month she doesn’t bring it anymore. If I jiggle it, she will play for a little while but she won’t fetch it. That was her favorite thing. She took the feather up the steps, down the steps and into the screened porch. It was her constant friend. Now napping is her constant friend. It happens. It happened to Hazel and to Morgan. I miss the old Gracie! 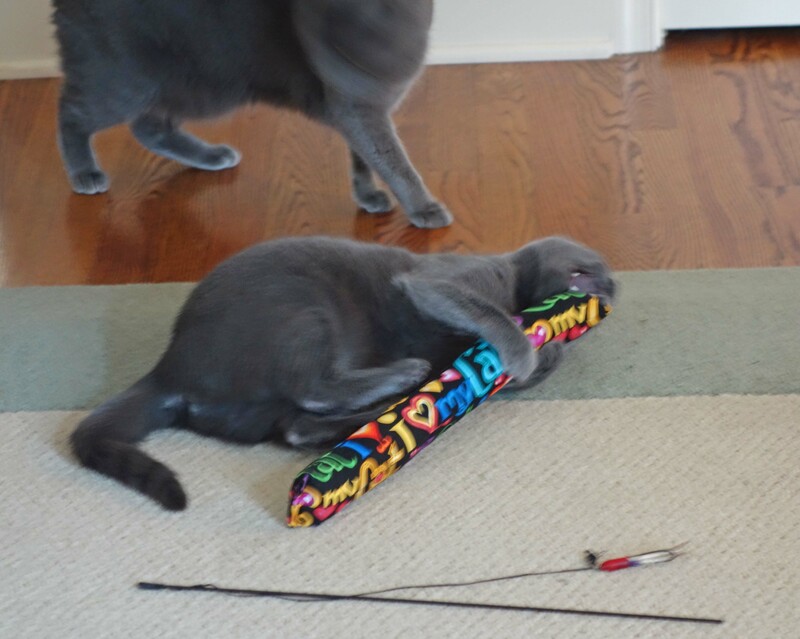 This entry was posted in Cat Adoption, For Animal Lovers Only, Humor, Sassy cats and tagged animals, cat toys, cats, cats losing interest, cats playing, Gracie, pets, pets aging by Kate Crimmins. Bookmark the permalink. It’s kind of sad. My cats laugh at me a lot. I’m often calling them and they are right in front of me but hidden in a blanket or something. They prefer to watch than response. They think it’s hilarious! She may come back to it at some point. She will always be your baby girl no matter her age! 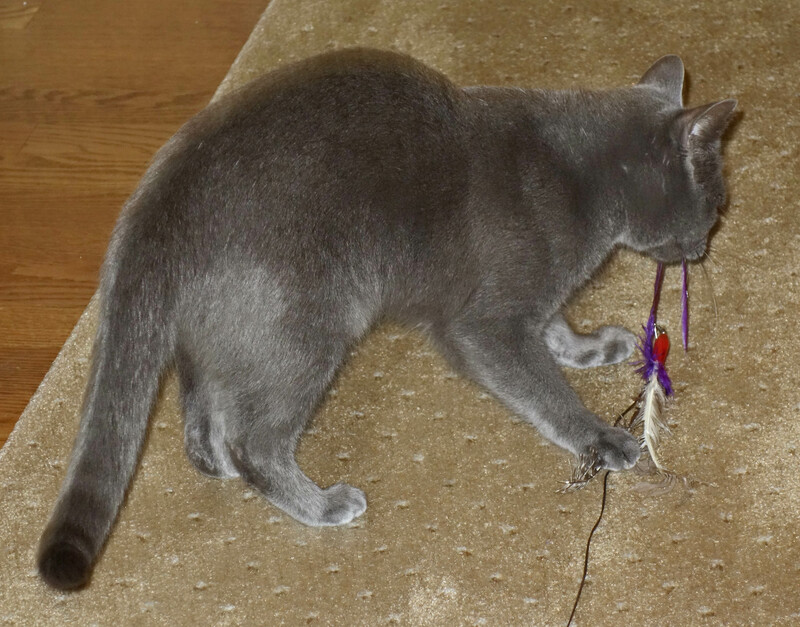 After your cats give up their favorite toys, how do they entertain themselves? Naps, annoying humans, eat. Gracie still runs around and chases the other cats so she is still active but Hazel and Mollie are definitely seniors. You’re right–seniors don’t need many toys. Water skis, basketballs, hula hoops, who needs them? I got talked into a zip-lining trip last weekend, and though it was fun to zip across ponds and between trees, it was also hard to climb to the high platforms and walk across the bouncy swinging bridge. Who needs it? Next time the kids can go without me. Our children do outgrow us! They get old too fast! My cats are the ultimate of contentment! They do grow up. And we forget how exhausting they were…until we get another kitten. Or puppy. When they are young they bring so much energy into the house. Gracie exhausted all of us humans and felines except maybe Morgan. She’s still feisty though. I saw Hazel bop her on the head yesterday. My old cat Jake was the best cat trainer. He had this stern black cat look about him that reminded me of a Mother Superior. No one messed with him. Maybe but the play all day part may be gone. This past week she played under a bedspread that was drying. It was her fort! Maybe this long hot Summer has made her lethargic and looking forward to Fall when she gets her pep back. I know this heat and humidity has zapped my energy. We’ll see. We’ve had great weather for the last 2 days (that’s a miracle!). Maybe she’ll perk up. We get rain, heat and humidity on Tuesday or Wednesday. I’m enjoying a short spell of good weather. Sounds like you are a few days behind us in the same weather pattern. I knew it was too good to last! I am in the “hoping this lasts forever” mode but I know it won’t. Yes, I must be further east. Rainy and stormy yesterday and foggy this morning so stay tuned in your neck of the woods. My friend lives in Honeoye Falls, NY and she gets the exact same weather as here 24 hours later. We are north of Philadelphia. Not sure how long it takes, but it gets here. I’d love to have seen her trying to engage you in a game while you’re trying to eat! Cats and children–the same antics. 🙂 I think that if she’s moving on to other toys it just indicates she’s a smart cookie. She finally got bored? It was truly annoying until she stopped. Now I miss it. She is still more active than the other cats but her naps are getting a little longer. My play:nap ratio has changed as well. It happens to the best of us! It’s hard to see them grow up but as long as they are happy! Awwww! It is so hard to see young adventure seekers morph into sedate nappers. Awwww… I guess she is growing up. Either that or it’s because that feathered thing is no longer a feathered thing. It kind of looks like a nothing burger. I tried putting a new feather on it a while back and she didn’t like that either. Cute. Love her bunny kicking! Kitten antics are such fun. Glad you got Gracie in time to let her enjoy the last vestiges of youth! Or be abused by the last vestiges of her youth! I didn’t remember that cats can go through phases. We had only one kitten; the others were rescues. Count me in for sleep. Taking a nap is good for everyone around me. I announce I’m going for a half-hour snooze, and others either sleep or do something they were longing to do without me. We all benefit. Works like that here too except my half-hour naps are longer. Oh, I know. Hate it when they start with the napping and just seem to give up on toys. Z used to make a play toy out of every thing and then one day all she wanted to do was snooze in a box or on my lap. On my lap mostly which made getting anything done impossible. But that’s the best excuse for not getting anything done! I put a bedspread on a chair to dry and it became her fort. That was yesterday so maybe it’s not all over yet. I love my cat. After the kitten stage, they start being laid back. Reboot lies around all day. However, in another place we lived, I had set up a night camera to observe the living room and hallway due to some strange activity. She would play at night, running and jumping, or with a toy. During the daytime, about the only thing to get her going is a laser pointer. She loves it. She is also 14 this October. They will play with a laser but only for a short time. Short attention span! Wow, Kate! Even I chase a laser. I have the attention span of a gnat according to Michelle. As you may know, Ray has never been a “play with toys” dog and we consider him “low energy”. He is constantly napping, and we can speculate that his low energy could be the residual effect of having heart-worm many years ago. Time flies though. He has only been with us a seemingly very short time, but is already showing grey around his muzzle area. One just never knows … especially with a rescue of undetermined background. One day you wake up and notice signs of aging on your pet. They hide them well but I can still see them. Jake, my all black cat, started to get gray hair in his fur. I’m glad you told us this. I thought all these years it was ME doing something wrong. Yes, our cats lost interest in feather toys. They seem to like playing with each other better. Then napping to recuperate. They play with things but their attention span is so short I can’t even get a blog post out of it! Now napping…I have hundreds of pictures of that! Napping sounds pretty good to me! Obviously you are beyond kittyhood too! Ah, they grow up too fast! They do and since we don’t know how old she is I’m always guessing. maybe she wants an interactive feather or a phone with feather app like all kids today? Hahaha, Easyweimaraner, you crack me up! Thanks for the morning laugh! Yes, she needs her own phone! Next she’ll want a scooter!